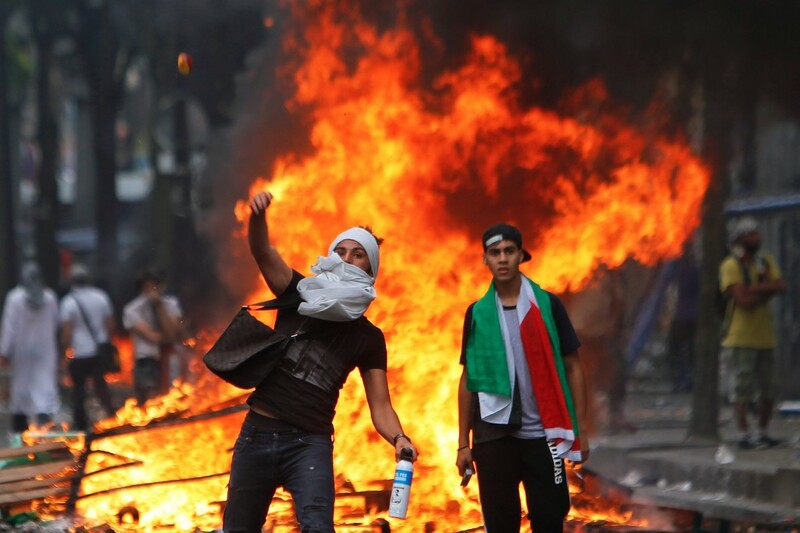 After the civil disturbances of last weekend, the French government banned all public forms of protest this weekend in support of the Palestinians in Gaza. The bans resulted in Muslim residents and politicians crying foul, claiming this was a smear on France’s Democracy and against everything the democratic process stands for. What is their demand? One riddled with irony. They claim to want the Palestinians in Gaza to live in peace and freedom under their current government. Just one problem they conveniently forget. Their government is run by Hamas, a terror organization that is anything but democratic. The irony is glaring. In democracies all over the world protestors are shouting angrily against the “Zionist entity’s aggression” against the people of Gaza. An aggression that is a response to the constant barrage of missiles from Hamas. Missiles bought with the money donated to Gaza to help the people. Money donated to the most non-democratic tyrannical government one could find. A government that will hurt anyone that opposes them from within and that does not allow any other party to rise within its territory. THIS is the government that protestors are using the luxuries of democracies platforms all over the world from which to shout “Free Palestine”. They just have no clue what exactly they are freeing them from and more importantly, what they are freeing them to. There is only one democracy in the entire Arab world, and that country considered the Arab world’s one democracy is Turkey. A democracy with a government doing everything possible to put a stranglehold on the system to eliminate any other party. The only real democracy in the entire region is the so-called oppressor, Israel. So next time you hear a Palestinian supporter shout “Free Palestine” ask them the following question. Free them to do what? To be ruled by terrorist and tyrants? Most if not all will have no other answer other than, “free them from the Zionist pigs”. They have clarity when it comes to their hate, but little sense as to how to truly better the lives of the people they claim to care about, while using the comfort of democracy to shout merely for the sake of shouting. The most ironic part of this whole thing is that at least for now the people they are hurting the most are the people they claim to want to help. This entry was posted on Sunday, July 20th, 2014 at 11:38 am	and tagged with Bring Back our Boys, democracy, France, Free Palestine, French, Gaza, Hamas, Israel, Muslim, Palestinians, turkey, Zionist, Zionist entity, Zionist pigs and posted in Uncategorized. You can follow any responses to this entry through the RSS 2.0 feed. « Which Jet is Really Hurting Gaza? Malamud writes, “In the locker room Pop asked Roy to explain why he thought the cover had come off the ball. 1913: A day after Philadelphia Athletics beat the New York Giants four games to one in the World Series, manager John Mc – Graw gathers ex-Orioles players for a reunion.